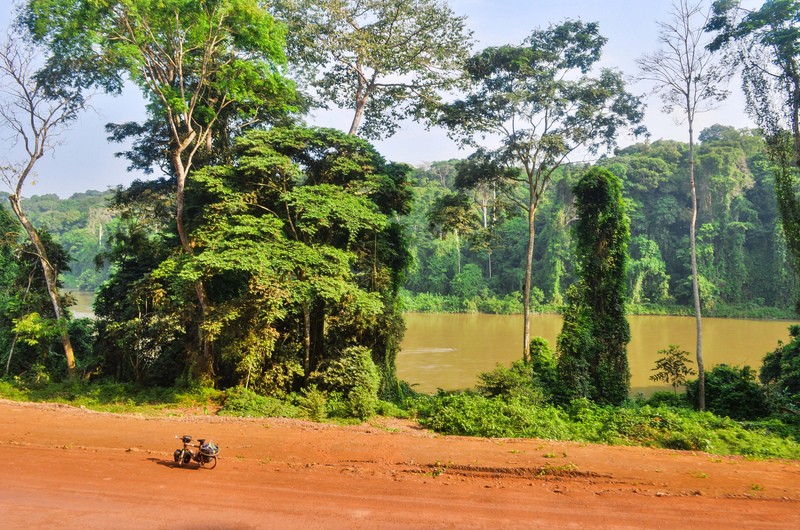 Spanning over 700 miles, the Ogooue River (Ogowe in Myene language), is the principal river of the country of Gabon, and the 4th largest river on the African continent. It’s characterized by its dark-colored waters, its numerous rapids, falls and mostly its swift currents. The Ogooue basin with its 86,000 sq mi density, covers 90% of Gabon. It takes its origin in the Lekoumou region in the city of Kengue, in the Congo Republic. It also consists of rocks, sand, small islands, and falls. Its course from East of the country to the small town of Ndjolé is non-navigable. 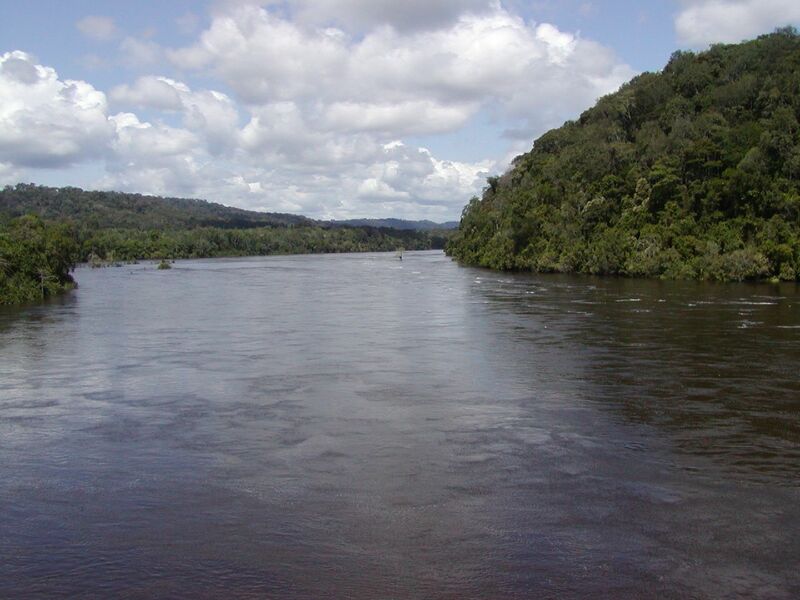 The river has over 22 tributaries, the Mpassa River located in Franceville is its main tributary. The Ogooue and its tributaries, overall drain most of the country, which explains the large amount of swamps and constant floods during raining seasons in the main cities of Gabon. The Ogooue River empties into the Atlantic Ocean after changing into a large delta of 62 miles long and 62 miles wide in Cape Lopez , near the city of Port-Gentil. Most of the Equatorial Forest in Sub-Saharan Africa, is known to have first been inhabited by Pygmies, Bantu populations migrated to the region some 4,000 years ago. Pygmies are mostly people of the forest, they hardly ventured further on the main course of the river. Bantus, however are known to be skilled paddlers, they will sometimes venture against the strong currents of that river as the Ogooue was also the major route for trades between different indigenous tribes. The first European to venture in the Ogooue River was Pierre Savorgnan de Brazza (Founder of Brazzaville), who traveled in the area in the 1870s. He was one of the first explorers to attempt an expedition deep in the Equatorial Forest. He reached the source of the Ogooue and went further on to the Congo River by following the Ogooue River upstream and proceeded overland to the Lefini River. The river consequently became the point of exchange between Europeans and indigenous populations (mostly during the slave trade); where they would exchange alcohol and some other goods against ivory, rubber, and palm oil brought from inside the country. The flora of the Ogooue consists of undisturbed rainforest with some savannah grassland where the June-September dry season is the longest. It is home to three species of African crocodiles such as the Nile Crocodile, the Slender-Snouted Crocodile, and the Dwarf Crocodile. 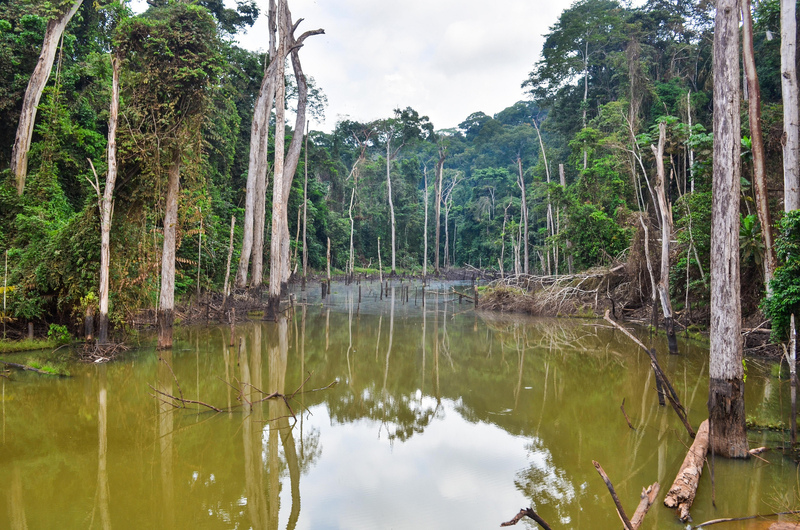 The Ogooue basin accounts for about 325 fish species, amongst which ¼ are endemic; like the Snout fish and Killifish. It is also the locality for the African Keeled Mud Turtle and Catfish. The river has nurtured people’s imagination through time. Its dark waters together with its swift currents have claimed many lives, probably because of these two factors (it is impossible to swim in the river). The most popular myth is the myth of Mami Wata, who is said to be a mermaid with pale skin and long hair, who sometimes wanders on the river banks or a rock. Legend says, that one must not see her face, for it is a premonition for something bad about to happen in the near future. The second myth involves a dragon-like creature, commonly called “Jago-nini”or “N’yamla” by the Fang people (a local tribe). The monster is said to look like a Diplodocus, and has been sighted several times, emerging from the water. The Ogooue has been a major transportation route for many years, way before the “Transgabonais” train line was established to link Libreville on the West Atlantic coast to Franceville inland, on the East. The river is navigable from Ndjolé to the sea, and is used to bring wood to the Port-Gentil Harbor. It is also essential for tourism, several major conservation reserves like the Lopé National Park are bordering the river, and rides on the river are one of the main attractions offered to tourists. 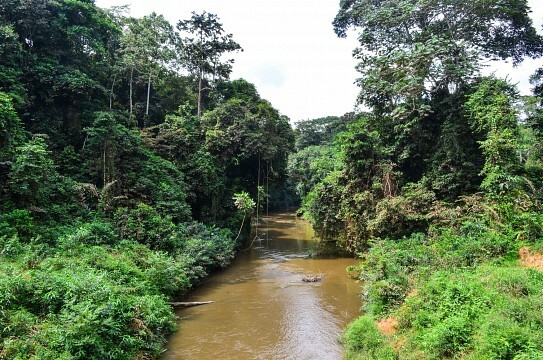 It has a catchment area of an average population of 4 people per km², and has over 13 towns along its course, among which the town of Lambarene, the first commercial point found on the Ogooue. It also facilitates, together with its tributaries, the agricultural sector with major production of plantains, yams; cassava, rubber; taro, groundnuts; pineapples, and sugar cane. Most of these goods are produced in rural areas and brought to populated cities like Port-Gentil through the river. The point of departure is Libreville, served by the Libreville International Airport (AIL). You can then access the river when visiting the main recommended touristic sites like; Lambarene, Franceville, or La Lopé site. All sites are reachable by train or road, when departing from Libreville. The three sites have touristic attractions bordering the river or its tributaries, like the Lopé Hotel and the Albert Schweitzer Hospital in Lambarene. It is possible to enjoy rides on the river while visiting, but swimming is prohibited due to the currents.